We did the obligatory wandering around between sets as we had time, even though there wasn’t too much festival to wander through. But we did do the obligatory poutine (and in Geri’s case, fries without gravy or cheese). 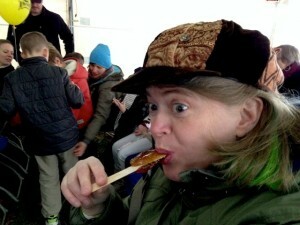 And we did the obligatory maple syrup on a stick, which was made entirely of yum. And which resulted in one of two best pics of me taken the entire weekend. Fortunately, though, most of the festival was inside tents. Where the music was. Which was the entire point, and so we were happy to hang out in the nice heated tents! We spent some time going around the merch and organization tables, just to chat with folks as well as to see what was being sold. I had a nice chat with the lady at the children’s books table, telling her about how I was reading Quebecois YA to improve my French. Bit of a shame that every book she had on her table was way below my reading grade, otherwise I totally would have bought something. On the other hand, I did also note that she had a copy of a Bone graphic novel in French. And I’m also rather smug and happy that I am, in fact, capable of pulling plot out of a Quebecois YA novel! I did however very happily buy the Légers’ new album from another table, and Geri wound up buying two–one for herself and one for her sister Pauline in New Brunswick! Dara wound up finding the table that’d sold her the tea cozy-slash-frog hat the last time, and getting frog mittens from them because she’d forgotten to bring gloves. This led to an entire weekend of frog boxing. But really, the proceedings were ultimately all about the music. Starting with Bon Débarras! 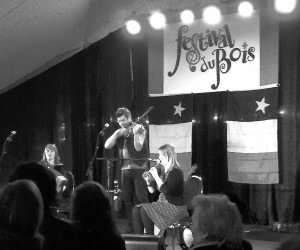 I had the pleasure of seeing these boys for the first time on my first excursion to Festival du Bois, back in 2012. I very much liked them at the time and eagerly snapped up the one album they had available. And last year, I even more eagerly snapped up their current album. So I very much wanted to see them again this year, even though we didn’t get there in time to catch their set on the big stage. 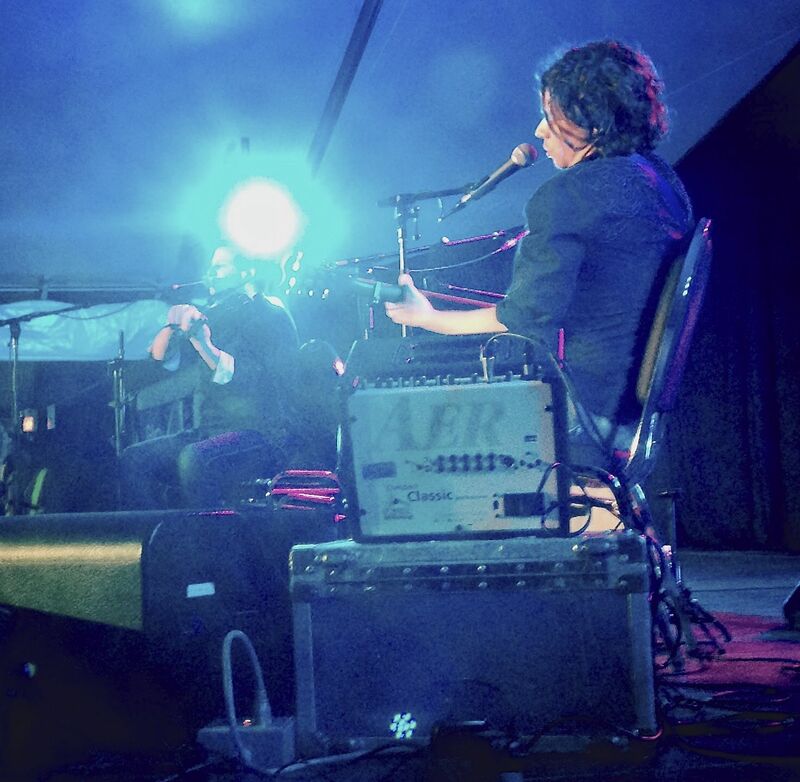 Instead, I (reluctantly, but I made up for it on Sunday) elected to skip the Yves Lambert Trio on the big stage so we could catch Bon Débarras in the workshop tent! Their set in that tent was short by necessity, but it was crackling good fun. I noted in particular that they did “Tombouctouche” off the new album–and gave a little bit of background on the name, which is apparently supposed to reflect how they fuse North American/Quebecois style with some African style as well. It’s a smoosh of “Timbuktu” and “Bouctouche”, I believe they said. Excellent. And I was very, very pleased that they did “Chien fidèle”, which is hands down my favorite song of theirs. As Geri is a dog owner, she was also entirely down with the notion of a song about stomping all over the hood of a car that hits your dog, too! What made that song particularly amusing was that there was an actual dog outside the tent, too, who started barking just as they were starting the intro to the song. The band made cracks about the dog being part of the act, and of course, that was just all the more encouragement for us to howl for appropriate doleful atmosphere to lead into the first verse. Something happened to their sound setup on their last song, though. I caught one of them saying “pas d’electricité”–but I don’t have enough French to know what happened! They certainly did roll with it, though, cheerfully jumping off the tiny stage at the front and doing a full circle around the tent with their instruments, entirely unamped. Great fun! As anybody who follows my blog for more than five minutes running knows, De Temps Antan are one of my very, very favorite Quebec bands and I haven’t been able to shut up about them since I discovered them! So attending as many of their sets as possible was mandantory. Nor did they disappoint. We hit their show on the big stage next, settling in at a table not too far from the front, since we were going to be there until the end of festivities that day. However, being, well, me, I had to get up to boing not long after they got started. And take quite a few pictures! Mostly I hung out on the side of the dance floor–because, as was entirely just and proper, the floor flooded with people only a song or two in on the set. I was particularly delighted to run into some of the ladies from my session group in Seattle, too, and entirely unsurprised to see them stepdancing (way better than I can) right in front of the stage. Several of my pics were blurry because my hand on a camera isn’t as steady as I’d like. But I like this one. It takes a real professional on the bouzouki to keep playing while your fiddle player’s head is apparently spontaneously combusting! De Temps Antan is a very tough act to follow, particularly when your set is plunked into the dinner hour. A lot of the crowd cleared out after De Temps Antan left the stage, but La Famille Léger, I feel, rallied nicely! 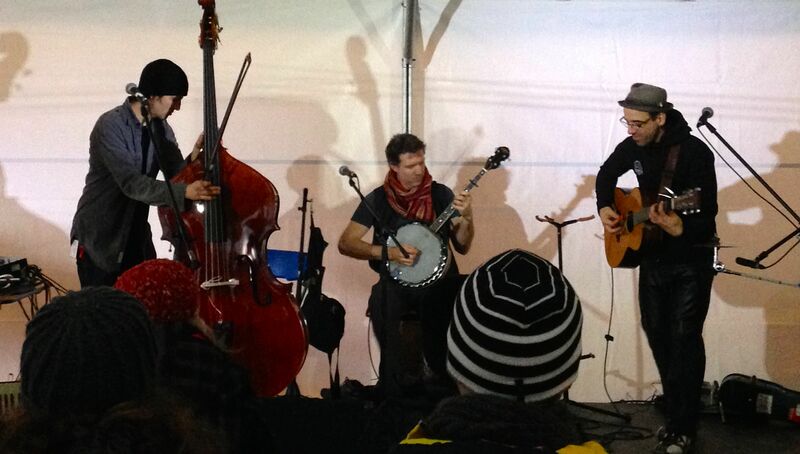 And I’m not just saying that ’cause I play at session every month with these folks. I’ve already posted about the Légers’ new album, and it was a distinct pleasure to hear them play several of the things off that album during this set. 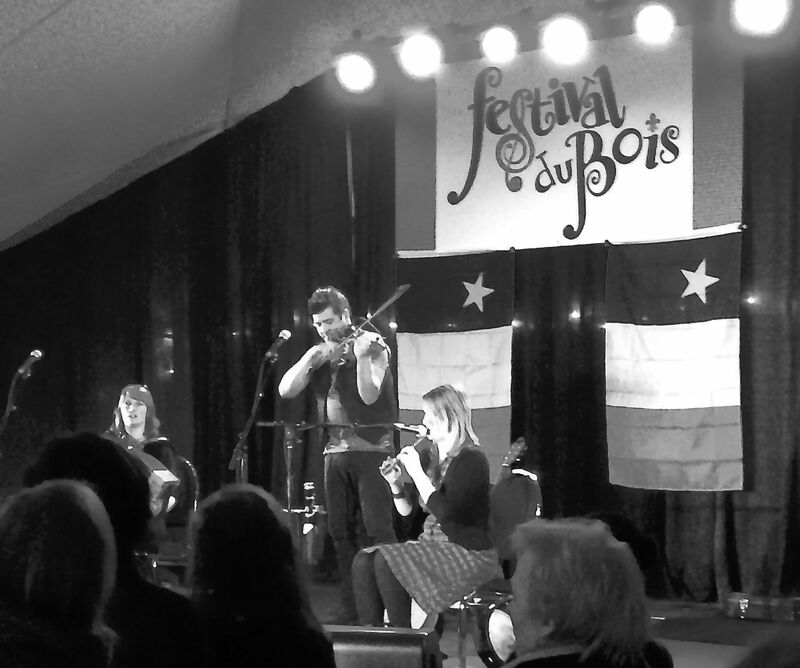 Great fun as well when they got the crowd up and parading around the tent, making noise by banging on anything we had handy–which was apparently an Acadian tradition! I am FOR this. It was a rather larger version of what Bon Débarras had done in their set, really, and a lot noisier as well. Vishtèn was the last act on the big stage for Saturday, and yet another act I’d seen before and was looking forward to! I very much enjoyed seeing Vishtèn for the first time in 2012 in St. Johns’, and this time around they were every bit as lively. I particularly noted that one of the two women in the group is a whistle player and that she does podorythmie. Speaking as a wind player inching her way into a tiny repertoire of tunes and a baby podorythmist, this is highly relevant to my interests. As is Vishtèn in general, being one of the few groups I’ve taken to in Francophone music that are mixed-gender and with primarily female vocals! I don’t know their material well enough to recognize their songs yet, but I did love their set! Even if all my pictures came out wobbly and purple. But I did at least have one that could be salvaged at least a bit in iPhoto! Y’know how I said up there that I do in fact go to monthly sessions with the Légers and the rest of the Seattle session crowd? That got me an invite to the after-festival session, courtesy of Barbara. So Geri was willing to ferry me and Dara to the hotel where all of the musicians playing the festival were staying, and we showed up to hang out a bit and see what was going to happen. So Dara and I parked on the far end of the circle, trying to see if we could keep up with the Légers. And I was okay with that, since even though I’m still very much a session n00b, I know the Légers and they know me and they’re okay with me quietly twiddling around on the edge of things, trying to figure out tunes. But then a bunch of other people from the various bands I’d just been watching started showing up. Two of the guys from Bon Débarras joined the circle, as did an excellent percussionist we’d seen on the stage earlier in between our various wanderings around. A couple of the members of Vishtèn showed up, hanging out on the edge of the room talking. And Éric and André from De Temps Antan. And I started thinking yipe and this room just got way, way out of my musical league and that was before Yves Lambert showed up. At which point my brain went oh god serious session is serious and it was about then that I decided that trying to say hi to the De Temps Antan boys was way less scary than trying to make noise on any of my flutes in a room that contained Yves Lambert and his accordion. So I got up and said hi to Éric and André instead, since they’d met me at Harrison Hot Springs last summer and knew who I was, and I’d friended them on Facebook as well. Chatting happened! And I got Éric to sign not only the De Temps Antan CD he kindly sent me by way of apology for taking a while sending me the Norouet CD I’d bought from him–but ALSO my copy of the album he’d done with his brother, Le sort des amoureux. Since I do indeed follow both Éric and André on Facebook, too, they knew I’d gone through some medical tribulation last fall–and they asked how I was and I sorta kinda mighta gotten hugged. *^_^*;; And then André also hugged Dara and then both of us again, when I told him she had gone through three rounds of eye surgery! Fiddle player hugs. Good for what ails ya. And that was pretty much the capper of an all around excellent Day 1 of the festival. We couldn’t stay too late on the grounds that Dara’s still on the very tail end of long-term recovery from eye surgeries, so we had to pace ourselves and rest up for the next day. Not only round 2 of the festival, but De Temps Antan at the Rogue! Tune in next post for part 2–and what did, in fact, happen when Pierre-Luc got in his signature! Le Vent du Nord and Genticorum videos!